Did I hear a collective groan by chess fans around the world as Veselin Topalov comfortably defeated Vladimir Kramnik in the eighth game of the World Championship match in Elista? After Thursday’s eighth game, Kramnik may be wondering whether he may emerge from the match smelling of roses but without the World Championship title. Although the match is now tied at 4-4, Topalov has the momentum after round 8, in which he defeated Kramnik in a 52 move, four and a half hour game. Topalov credited his victory on his good opening choice saying “I won deservingly.” Kramnik tried to insist that he was still in good shape and that this loss was not tragic. “It was not my day,” said the Russian after the game (at a separate press conference to Topalov, of course). “The whole game was one big error [by me].” When a journalist compared his disaster on Thursday with his crushing defeat with White against Peter Leko at his 2004 title defence, Kramnik agreed that the sprit of the loss was similar. In the press room, Topalov win was greeted with a curious reaction – the fear that every Topalov victory will increase the chance of a later legal challenge by Kramnik. The biggest worry for Kramnik is not (as a recent protest letter from the Kramnik camp alleged) that Topalov’s team will plant an electronic device in Kramnik’s toilet but that the Russian has been comprehensively out-prepared in the opening in the past two games. Kramnik’s great defensive abilities enabled him to create winning chances in game seven but at top level this is hardly the way to win games. (One of the more bizarre conspiracy theories has Topalov beginning to use electronic assistance, since any allegations by Kramnik against his opponent will only look like sour grapes. The conspiracy theory notes that there is no Faraday shield over the playing hall (as promised but not delivered) to avoid electronic signalling and that the metal detector to which the players are subject at the start of each game would not pick up the sort of device used at the World Open. Of course the theory makes the elephant-sized assumption that Topalov would even consider getting electronic help but the suggestion has dogged Topalov ever since he made his big leap forward 18 months ago. The theory probably has too many legs to be slowed by a single blogger but here goes -having watched Topalov win the world title in Argentina last year, and also at major tournaments in Spain, Bulgaria, Germany and Mexico, I can say that Topalov’s play, his demeanour, his post-game analysis and the actions of his seconds – who were sometimes talking to me when they were supposed to be signalling to Topalov - gave no hint whatsoever that he was getting outside assistance at any of these tournaments, all but one of which Topalov won. Back to the real world. 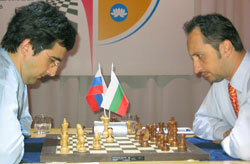 Here’s Topalov’s great performance in game 8 and please don’t ask what percentage of his moves match Fritz! 1.d4 d5 2.c4 c6 3.Nf3 Nf6 4.Nc3 e6 5.e3 Nbd7 6.Bd3 dxc4 7.Bxc4 b5 8.Be2!? As a teenager, Kramnik had plenty of experience playing on the Black side of this line but his only previous trial of this move on the White side (in a 1998 blitz game against Garry Kasparov) proved unconvincing. Despite Topalov almost never taking the Black side of a Semi-Slav, the Bulgarian was well prepared, leading the game into messy territory very quickly. 8…Bb7 9.0-0 b4 10.Na4 c5!? 11.dxc5 Nxc5 12.Bb5+ Ncd7 13.Ne5 Qc7 14.Qd4 Rd8 15.Bd2 Qa5! Apparently Kramnik was unconvinced by his attack and decides to seek solace in an endgame but White’s initiative proves no compensation for Black’s material advantage (Yes, Virginia, two knights are worth almost a pawn more than rook and pawn.) It would have been better for Kramnik to try 19.b3!? Qb5 20.Qxa7! Now 20…Rc8 21.Nd4! gives White a big attack but Black is probably fine after 20…Qb6. Now Black’s job becomes very easy but White has almost run out of moves, e.g. 41.Rb5 Ra7! followed by …Nc7, trapping the rook. 41…Nc5! 42.Rg7 42.Rb5 Nc3! is also hopeless. However now the b pawn falls and the rest is a massacre.